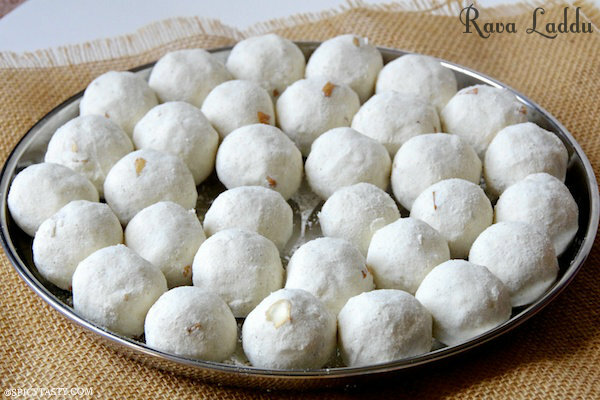 Rava Laddu or Sooji Laddu is a popular Indian sweet made specially for Diwali festival and also on special occasions. It is easy to make and takes only a few minutes. 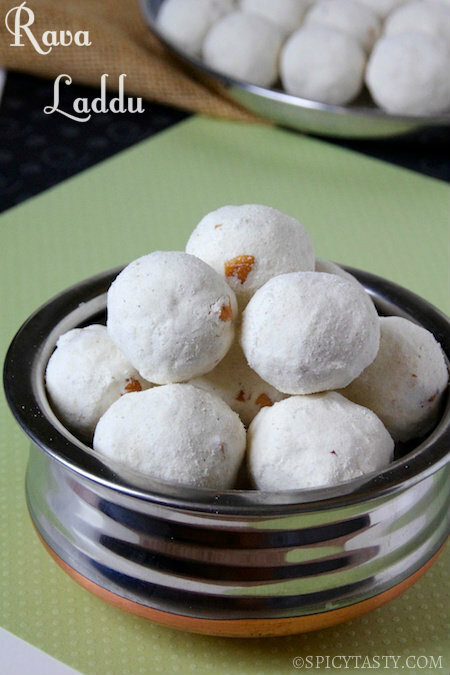 There are different versions of this laddu but this is my favorite and my mom’s recipe. It has a smooth texture and it just melts in your mouth. 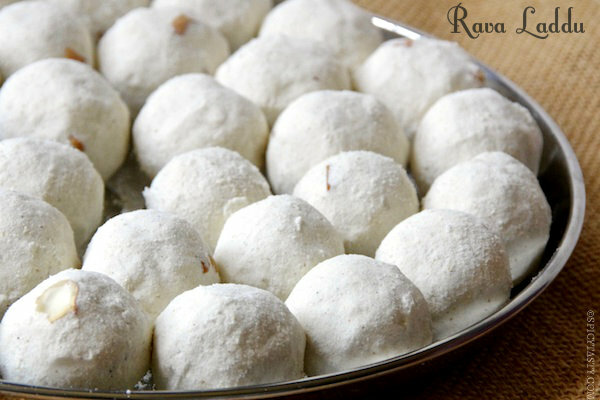 Sooji and sugar are finely ground and mixed together and made into laddus with ghee. It is generally tough to fine grind sooji (rava) at home. So my mom gives it to the flour mill for grinding. But for people who live abroad, you can bring finely ground sooji from India or just use your dry grinder (or mixie) for grinding sooji. See recipe for details. Dry roast rava until light golden color. In the same pan dry roast cardamom for a minute. 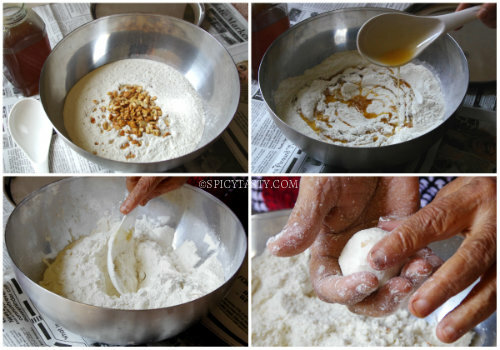 Grind rava and sugar in a flour mill (this method is for those who live in India and have access to flour mills). Another method: Grind sugar and cardamom to a fine powder and sift using a fine sieve. Grinding rava in a dry mixer grinder (mixie) is a challenge. It consumes time. Grind it to a fine powder and sift using a fine sieve. This process needs to be repeated to get a finely ground flour. Both rava and sugar has to be finely ground. Fry the broken cashew nut in a teaspoon of ghee. In a big bowl mix ground rava, sugar and cardamom mixture. Melt ghee and slowly add 3/4 th of it to the bowl and keep mixing. The flour will hold its shape when press and hold it in your palm. At this stage stop adding ghee. 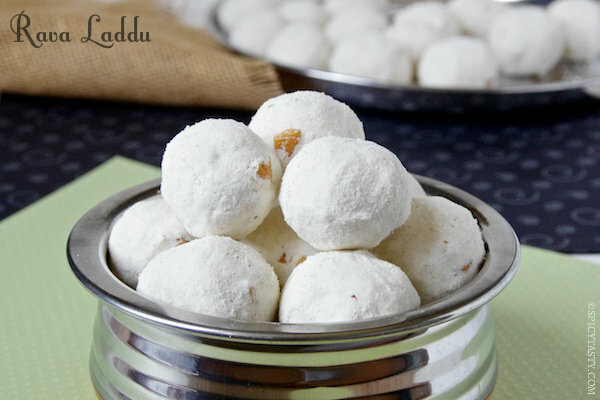 Take a handful of flour and shape it into small balls.